Herman Miller has always had a "for the home" division, but lately has rolled out some Work at Home products that are unique to the division. The Sense desk is one of a collection of desks with really interesting design. Simple, intuitive design hits home. 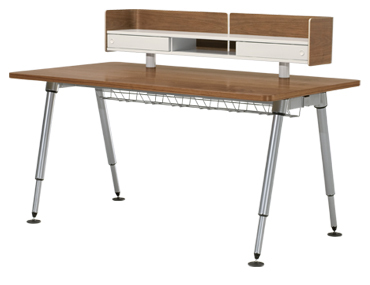 Sense features a spacious work surface, easy plug-n-play assembly and stylish, technical lines. Install the optional desktop storage cabinet for added workspace intelligence. Its height adjustable and they say no tools are required for assembly. My favorite part, of course, is the cool off desk cabinet for stashing your desk top crap out of the way. And there is a great cable tray under the desk to tame your tangle of wires. They make a matching media cabinet too if you like an matching outfit.